Roger Goodell and the NFL desperately need you to believe they did not see the Ray Rice tape until this week. We do not believe them, nor do those reporters who were hung out to dry by the league. If it emerges that the NFL did view the video before suspending Rice for just two games, well, now we're an 18-minute gap shy of a Nixon-style coverup. So how far would Goodell go to stick to the story? Last night, we found out. Goodell gave his first public comments to CBS News's Norah O'Donnell, and he offered a very lawyerly denial. He was asked if anyone in the NFL had seen the second video. "No one in the NFL," Goodell said, "to my knowledge." The problem for the NFL, and what may be the lasting legacy of the Ray Rice debacle for the league, is that for this to be true, the NFL has to tear down its carefully cultivated public image. If the NFL did not see the tape, then the NFL's vaunted investigatory and disciplinary apparatus, the supposed monument to the Goodell era of the NFL, is neither just nor all-powerful nor even minimally competent. Here are facts, public facts that the NFL had at its disposal before handing out Rice's initial two-game suspension. The criminal complaint stated that Rice, "attempting to cause bodily injury to J. Palmer ...[struck] her with his hand, rendering her unconscious." Video from outside the elevator showed Rice dragging an unconscious Palmer. Upon viewing the tape from inside the elevator, prosecutors upped the charge against Rice from simple assault to third-degree aggravated assault, a felony, and dropped the charge against Janay Palmer. What did the NFL think happened inside the elevator? For Goodell to argue that the league never saw the tape, he is forced to explain how the tape changed anything. When pressed on it last night, he failed miserably. O'Donnell: But what was ambiguous about her laying unconscious on the floor being dragged out by her feet? Goodell: There was nothing ambiguous about that. That was the result that we saw. We did not know what led up to that. We did not know the details of that. We asked for that on several occasions. It was unacceptable in and of itself what we saw on the first tape. And that's why we took action, albeit insufficient action. And we acknowledge that, we took responsibility for that — I did personally — and I take responsibility for that now. But what we saw yesterday was extremely clear and graphic and was absolutely necessary for us to take the action we did. "We did not know what led up to that. We did not know the details of that." In service of buttressing his position that he had not seen the tape, the NFL commissioner stated that there could have been circumstances that justified or at least mitigated the fact that Ray Rice punched out a woman. O'Donnell: But what changed? I mean, on the first tape she was lying unconscious on the ground, being dragged out by her feet. Did you really need to see a videotape of Ray Rice punching her in the face to make this decision? Goodell: No. We certainly didn't. And I will tell you that what we saw on the first videotape was troubling to us in and of itself. And that's why we took the action we took. As I've said before, we didn't feel that was sufficient, we didn't get that right. But what we saw yesterday was extremely clear, it was extremely graphic, and it was sickening. This goes beyond admitting the two-game suspension was a screwup. It is the most powerful man in American sports, foundering on network TV, unable to contort the company line into a coherent defense. It's Roger Goodell embarrassing himself to maintain the narrative that the NFL never saw the tape. Because that narrative is more important to the job security of executives than is preserving the public's misplaced trust in the NFL's ability to be fair and moral, let alone decent. The NFL's defense is a self-indictment. The league's claim that it never obtained the tape makes a mockery of its inability to obtain the tape. It's worrying enough that the commissioner's office acts as police, lawmaker, judge, jury, and executioner; for Goodell to openly deride the league's ability to investigate its players is a frank admission that his office is an incompetent police, an incompetent lawmaker, an incompetent judge, and incompetent jury, and an incompetent executioner. O'Donnell: How is it that the NFL couldn't get their hands on the second tape, but a website called TMZ could? Goodell: Well, I don't know how TMZ or any other website gets their information. We are particularly reliant on law enforcement. That's the most reliable. It's the most credible. And we don't seek to get that information from sources that are not credible. TMZ knew what was on the tape. Casino security knew what was on the tape. Police knew what was on the tape. Prosecutors knew what was on the tape. Rice's attorney knew what was on the tape. Peter King's source knew what was on the tape. Chris Mortensen's source knew what was on the tape. A random Deadspin tipster knew what was on the tape. An AP sportswriter on a day trip from Philadelphia knew what was on the tape. Roger Goodell's continued employment hinges on you believing he didn't know what was on the tape. The NFL's version of events is that it bungled its investigation from start to finish, being either willfully lax in pursuing the tape or simply bad at it. The NFL's version of events is that it never thought to ask Rice or his attorney for the tape, even though one Baltimore-area lawyer who's defended players before says the league could easily have compelled Rice's attorney to turn over the tape: "I would certainly have to turn it over," said Steven D. Silverman. "There's no question in my mind that he would have the opportunity to ask that all reports and videos and other evidence that would be relevant to the commissioner's investigation be turned over to his office." The NFL's version of events is that it can't even accurately identify which police force is responsible for casino security, even though the league's own head of security used to be the commissioner of Pennsylvania state police and would presumably know how this works. The NFL's version of events is, basically, "oops." But don't take it out on the commissioner. O'Donnell: Do you feel like your job is on the line? 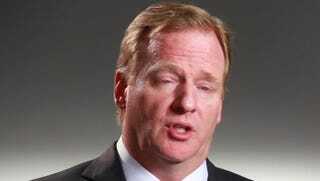 Goodell: No, I'm used to criticism. I'm used to that. Every day, I have to earn my stripes. Every day, I have to, to do a better job. And that's my responsibility to the game, to the NFL, and to what I see as society. Goodell, whose job is very much at stake, has unequivocally denied that anyone at the NFL saw the tape. So we're left with the official NFL position, which is that the NFL thought a two-game suspension was sufficient in a case in which the criminal complaint and video of the aftermath proved Rice had cold-cocked his fiancée, knew there was a tape out there but made its decision without having seen it, lied to reporters about having seen the tape in an attempt to justify that two-game suspension and smear a victim of domestic violence in the process, but wasn't actually able to view the tape because the all-powerful NFL couldn't twist anyone's arm. Let's assume for a moment Roger Goodell wasn't lying in his CBS interview. Let's assume everything went down as he described it. Who would be to blame then?